LinnDrum II: one of the rejected designs. 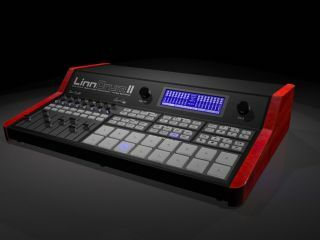 Roger Linn's LinnDrum II is fast becoming the Chinese Democracy of music technology hardware. The successor to the LinnDrum was first revealed at the start of 2008, but this original design was rejected. We were then shown another mock-up in September 2008 - but also told that this wasn't how the final product would look, either. Now Roger Linn has released a statement indicating that he and co-developer Dave Smith have had a further change of heart. It reads: "We're still hard at work but regrettably won't be able to meet our earlier estimate of a third-quarter 2009 ship date. The recent changes in the economy have caused us to rethink our design, which had become too expensive. "One problem is that Dave's customers and my customers had different views of what the product should be, so we had been working on a more elaborate design that we thought would please them both. Then the economy tanked. Oops. "The other issue is that Dave and his team have been having such success with their analog synths that they've been spreading themselves pretty thin trying to work on both projects." The upshot is that we now have no idea when LinnDrum II will be released or what it might look like. However, we do now know that this will probably be a Roger Linn-only product when it comes to branding and sale ("a beat-oriented product is more of a Roger product anyway," says the statement). It was previously suggested that there would also be a Dave Smith version of the LinnDrum II.